The Italian recovery is consolidating. The year 2017 closed with GDP growth of +1.4 per cent. The expansion should continue at the same pace this year before decelerating in 2019. With the January issue, the Report on recent economic conditions begins the publication of the PBO’s medium-term economic forecasts based on the Istat-UPB model. These accompany the analysis of international and national economic conditions and the short-term forecasts. 2018-2019: Italy continues along the path of recovery – Thanks to estimated fourth-quarter growth of 0.3 per cent over the previous quarter, 2017 is expected to close with GDP growth of 1.4 per cent (unadjusted for the number of working days). With favourable international conditions, this positive trend should continue along the same vein this year as well, before slowing partially in 2019, when the PBO forecasts GDP growth of 1.2 per cent. Compared with the recent growth projections of various institutions (Table 1) – projections that differ in accordance with the assumptions adopted concerning international variables and the public finances (in particular, whether VAT increases will be suspended or not), as well as calendar effects on the number of working days – the forecast for 2018 is slightly lower than the others with the exception of the IMF, which is the same. For 2019, the PBO forecast for GDP growth is in line with those of the Bank of Italy, CER and Confindustria, slightly lower than that issued by REF Ricerche and higher than those of the IMF and Prometeia. The forecasts for Italy are exposed to uncertainty of international origin, accompanied by the specifically Italian factors concerning the economic policy choices of the new Government. 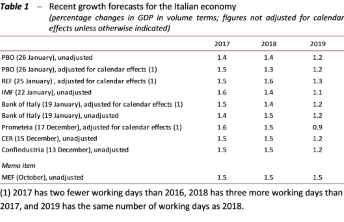 Domestic demand drives growth – In the PBO forecasting scenario, Italian economic growth is essentially driven by final domestic demand (Table 2), which contributes 1.5 percentage points of growth in 2017 and 2018 and 1.1 points in 2019. The contribution of net foreign demand, essentially equal to zero in 2017, turns negative by one-tenth of a point in 2018, before returning to zero in 2019. More specifically, investment, grows rapidly overall in 2017-2019, driven by the good outlook for demand, the continuation of favourable conditions on financial markets and tax incentives. Consumption, which in the final part of 2017 benefitted from a substantial improvement in the climate of confidence, is also expected to continue growing, benefitting ‑ especially in 2018 – from the increase in disposable income, which is sustained by the continuation of the improvement in the labour market. In 2019, consumption would be affected by the erosion of household purchasing power caused by the increase in VAT, but would still decelerate less than disposable income. 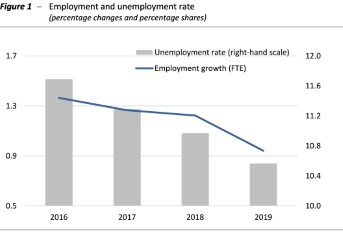 Employment picks up, but the decline in unemployment is slow – Against the general background of recovery, employment (measured in standard labour units) is forecast to expand by 1.3 per cent in 2017 and 1.2 per cent in 2018, before decelerating to +0.9 per cent in 2019 in reflection of slower economic growth (Figures 1). Unemployment will decline gradually (from 11.3 per cent in 2017 to 10.6 per cent in 2019), reflecting the continuation of the expansion in the supply of labour and the slow decline in the pool of long-term unemployed, which expanded considerably during the last recession. Inflation accelerates moderately – Inflation, as measured by changes in the consumption deflator, is forecast to rise only slightly in 2018 (an average of +1.2 per cent, compared with an estimated 1.1 per cent in 2017) before strengthening in 2019 (+1.7 per cent) under the impulse of the gradual increase in wage growth and, in 2019, the increase in indirect taxes (Figure 2). Next year, domestic inflationary pressures are expected to be partly offset by the deflationary impulse of foreign factors (a decline in oil prices and a further appreciation of the euro). 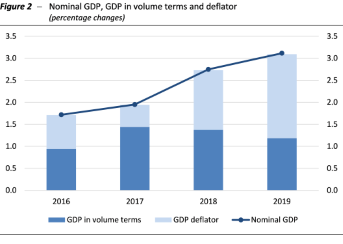 Against the background of an improvement in the terms of trade fostered by the strengthening of the euro, the GDP deflator is expected to outpace these developments, accelerating from an estimated 0.5 per cent in 2017 to 1.4 per cent this year and 1.9 per cent in 2019. Given the change in real GDP, the increase in inflation and the terms of trade, the PBO has forecast nominal GDP growth of 1.9 per cent in 2017, 2.7 per cent in 2018 and 3.1 per cent in 2019.